Sarah Herzog Hospital, established in 1894 is Israel’s foremost center for geriatric, respiratory, mental health and psychotrauma care, treatment and research. 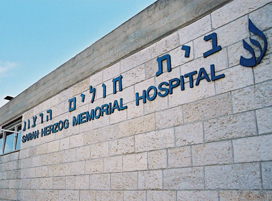 With 330 beds, Herzog Hospital is the third largest hospital in Jerusalem. Today the Hospital specializes in the full range of problems associated with aging-acute medical problems, physical rehabilitation; Psychogeriatrics; with special emphasis on the diagnosis and treatment Alzheimer’s and Parkinson’s Disease; senile dementia; Chronic Respiratory Care; Complex Medical and Nursing Care and Osteoporosis. A special Children’s Chronic Respiratory Care Department provides respiratory care for children ranging in age from three months to 18 years. Herzog’s Clinical Research Center for Brain Sciences concentrates on Neurodegenerative Diseases with a special emphasis on Parkinson’s Disease, schizophrenia, and other brain disorders and related diseases. The Hospital is in the midst of constructing the new eight floor Edith and Dr. Heinz E. Samson Medical Pavilion which will add 270 much needed beds. Thirty percent of those treated by Herzog Hospital are Holocaust survivors. Approximately 15% of Hospital patients are Arab Muslims or Christians. Off campus the Community Mental Health Clinic treats 2000 men, women and children each month. Special clinics treat children with Attention Deficit and Hyperactivity Disorder and Tourette’s Syndrome. Herzog’s IsraelCenter for the Treatment of Psychotrauma treats the victims of terror attacks, domestic violence, Holocaust survivors and now those suffering from the rocket attacks in both the north and south of Israel. It also provides trauma training to professionals throughout Israel. Since 9/11, it has also become an international resource center, working with trauma specialists throughout the world. Herzog is a major teaching hospital providing student and residency training in Geriatrics and Psychiatry, Psychology and Social Work for the Hebrew University-Hadassah Medical School. Division of Geriatrics: Departments specializing in Acute medical problems and rehabilitation; Psychogeriatrics; with special emphasis on the diagnosis and treatment of behavioral changes; Alzheimer’s and Parkinson’s Disease; senile dementia; Chronic Respiratory Care; other departments provide Complex Medical and Nursing Care; Osteoporosis and the full range of problems associated with aging. Children’s Chronic Respiratory Care Department: Is an extension of the Hospital’s successful 100 bed Adult Respiratory Department. The special new Children’s unit provides respiratory care for children ranging in age from six months to 18 years. Children provide a unique challenge within this very specialized field. Usually a tragic accident (such as by a fall or a car accident) causes such severe injuries that the child requires the assistance of a respirator to breathe for an extended period. Many others are a result of congenital defects and genetic diseases. Post Traumatic Stress Disorder-Victims of terrorist attacks, domestic and school violence, car accidents and Holocaust survivors and their children, suffer from a unique form of anxiety and behavioral problems known as Post Traumatic Stress Disorder (PTSD). Herzog’s Israel Center for the Treatment of Psychotrauma maintains one of the most effective treatment and research centers in Israel. It has already become an international resource center as well as working with trauma specialists throughout the world. Today it is a nationwide leader in helping Israelis cope with the violence of terrorist attacks and the war in Lebanon and the ongoing rocket attacks in southern Israel. The TraumaCenter has become the key magnet providing trauma counseling services, therapy and educational seminars in Jerusalem and throughout Israel. Finance: HerzogHospital is required to raise part of its operating budget, as well as funds for improvement, expansion and research from private sources, including planned gifts and bequests. Projects are supported through “FRIENDS OF HERZOG HOSPITAL” groups, overseas and in Israel, and by foundations and individuals. Donor Information: Extensive Gift and naming opportunities include the new departments of Physical Rehabilitation; Psychogeriatrics; Acute Geriatric Care; Psychiatry; Adult and Children’s Chronic Respiratory and Complex Nursing. In all departments patient rooms are available for dedication. With the construction of the Edith and Dr. Heinz E. Samson Medical Pavilion, there are also many new excellent naming opportunities. New medical equipment is also always a pressing need. Numerous research projects in genetics, Alzheimer’s, Parkinson’s Disease, schizophrenia and other areas require funding. The Hospital maintains a full range of endowment and deferred giving plans including charitable remainder trusts & pooled income funds.